As I'm sure you all know by now, I'm a big fan and supporter of Love Me Beauty and their monthly beauty box subscriptions. In my opinion, they're one of, if not thee best beauty box out there and one I'd highly recommend signing up for! The reason I love the brand so much if because they really care about what their customers want and ensure everyone is always happy with the items they receive each month! Now although I was already a big fan of their concept which gave their subscribers the choice of three menus each month, I'm an even bigger fan of their new concept which allows subscribers to make their own beauty profile and pick exactly what goes into their box! When you sign up to the website you'll be asked about your skin type/hair colour etc which then allows Love Me Beauty to give you product suggestions that suit you. They then give you six credits to pick the contents of your box. Most of the products are worth one or two credits depending on whether they're a sample or full size so that means you'll get at least three but potentially up to six products from their 'boutique' each month! There's also the option to add extras items to your box for a small cost - the prices are shown before you add them! As well as the concept, the box itself has also had a revamp and I'm just a little bit in love with it. It has a more sophisticated and luxurious feel and the grey/silver and rose gold combo is so pretty! The products themselves are also packaged differently and now come in a cute drawstring bag which can be reused! It will feel like a real treat receiving this in the post each month! The only thing that hasn't changed about the box is the value for money - it still costs only £10 including p&p or £9 if you add my discount code 'CG10' in at the checkout. 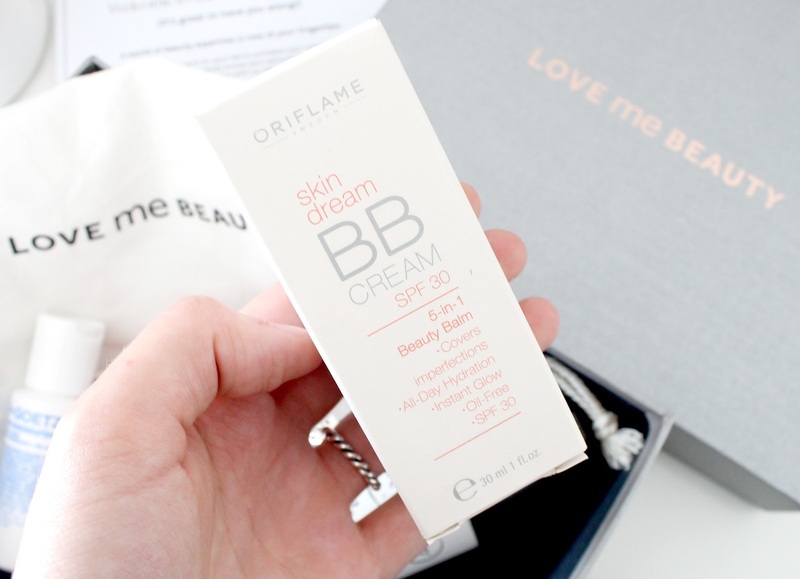 I really enjoy wearing BB creams so I knew I had to give this one from Oriflame a try! It promises to cover imperfections, provide all day hydration and add a glow which sounds like everything I could want from a BB cream and more! Its also oil-free and has SPF 30. I love the brand Percy & Reed so I just had to use two of my credits on their 'dry conditioner' which is perfect to use when your hair is looking a bit lackluster and needs a dose of moisture and shine! This product alone is worth more than the whole box and there was few other Percy & Reed products up for grabs in the boutique. I have to be honest, I've got enough moisturisers to last me a life time so I'm not sure why I picked this product - I think its because its quite a nice size for travelling and because it says its suitable for the most sensitive skin types, I thought it would be well suited to me. My skin has been crazy lately and I've been getting spots for the first time in my life so I want to strip my skincare routine back to basics with really simple products to see if that helps. 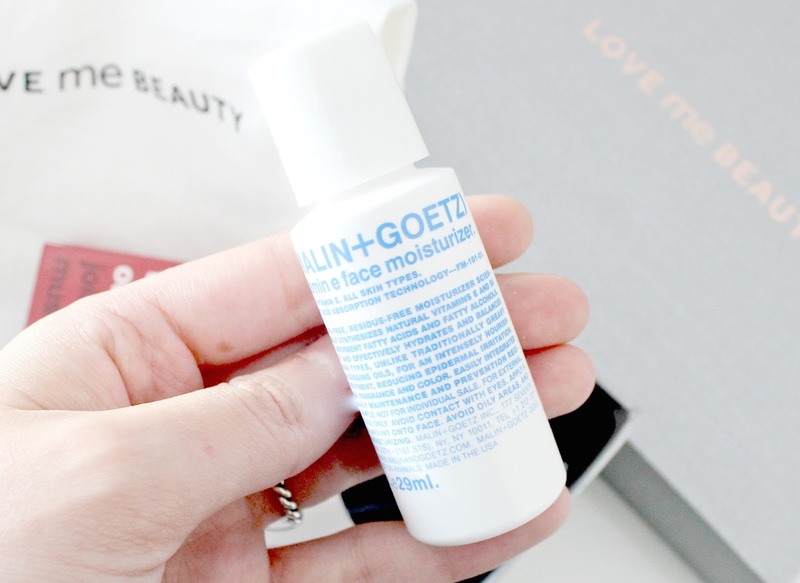 Malin + Goetz is also sold at Space NK, I guessed it would be pretty good quality stuff. Lets face it, they only stock the best of the best! So most of you will probably think this is a really strange choice and a bit boring, especially when there was other makeup products up for grabs! However, I suffer with a bad back and when it gets bad I often get sore muscles in my leg so I thought this would be worth a try to see if it can help! I've not tried it yet but I'm hoping it works! 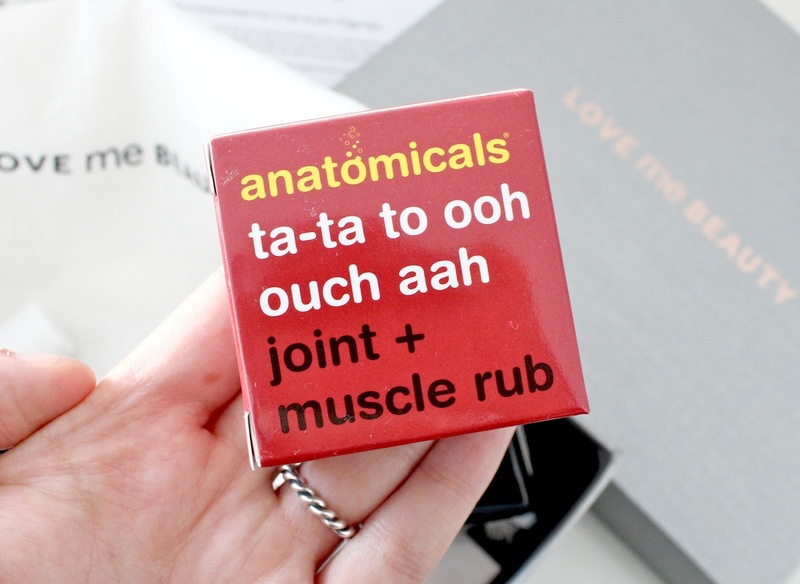 If this doesn't take your fancy, there were lots of other fun anatomicals products up for grabs. I'm really chuffed with the products I received this month and I'll get use from all of them which is why I love Love Me Beauty so much - I know I'm never going to get sachets or teeny tiny samples I'll never use! I realise the products I picked won't be to everyones taste so be sure to check out their boutique here to see the selection of products up for grabs. There's everything from makeup to skin, hair and body care! What do you think of the new and improved Love Me Beauty box? Dry conditioner sounds amazing - my hair ALWAYS needs this!! I have really bad joints and muscles so I actually got most excited about that item! I love the look of the BB Cream, sounds so nice! This looks fab, and the BB cream especially! And the packaging of the new box is lovely.